I’ve been a busy chocolatier over this bank holiday weekend! From making lots of ginger truffles (which seem to be our current bestseller), to devising new recipes (watch this space! ), to giving old favourites a makeover. This is a new and improved old favourite. 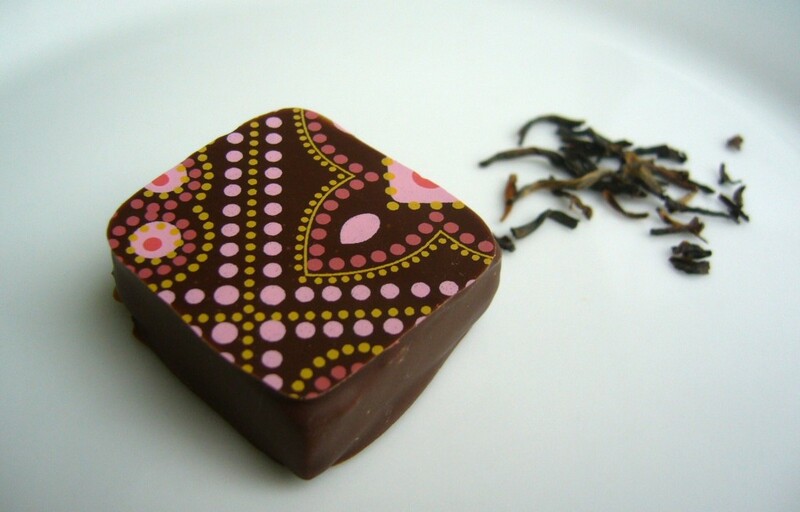 Kokopelli’s rustic earl grey truffle has been transformed into a chic bonbon, complete with pretty pink design and a revamped recipe. The ganache inside has been infused with earl grey tea, and made with a milk chocolate that boasts subtle caramel notes. The ganache is enrobed in a dark milk chocolate (50% cocoa solids) – our own special blend. This delicate chocolate is the perfect complement to afternoon tea. This looks just perfect! Yum!